The oldest City Hall in the United States that still houses its original governmental functions, and constructed from 1803 to 1812. 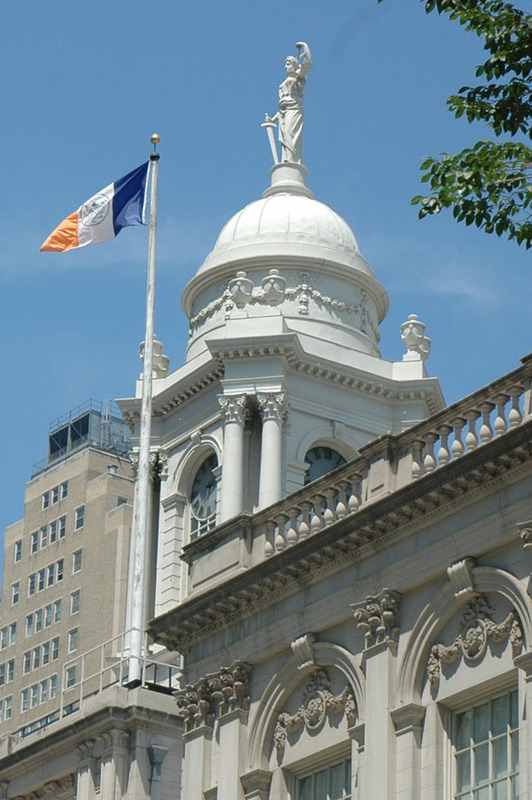 New York City Hall is a National Historic Landmark and is listed on the National Register of Historic Places. The building consists of a central pavilion with two projecting wings. There is a columned entrance portico capped by a balustrade, and another balustrade at the roof. The domed tower in the center was rebuilt in 1917 after the last of two major fires. The original Massachusetts marble facade, with brownstone on the rear, was completely reclad with Alabama limestone above a Missouri granite base in 1954-6. On the inside, the rotunda is a soaring space with a grand marble stairway rising up to the second floor, where ten fluted Corinthian columns support the coffered dome. The rotunda has been the site of municipal as well as national events. Abraham Lincoln and Ulysses S. Grant lay in state here, attracting enormous crowds to pay their respects. Located directly under City Hall plaza is City Hall Station, the original southern terminal of the first line of the New York City Subway. Opened on October 27, 1904, this station beneath the public area in front of City Hall was designed to be the showpiece of the new subway. Considered to be one of the most beautiful subway stations in the system, the station is unusually elegant in architectural style. The platform and mezzanine feature Guastavino tile, skylights, colored glass tile work and brass chandeliers. Passenger service was discontinued on December 31, 1945.